Aleira Salguero and Fanny Suárez discuss the challenges of medical and legal interpreting. According to Toastmaster’s International, a majority of the population considers fear of public speaking to be one of the worst fears in life, even worse than that of death. That notwithstanding, what happens when public speaking is accompanied by the responsibility of accurately rendering one language to another either in the medical or legal fields? NCTA’s September General Meeting encouraged us to think about the stressors present for interpreters and provided insightful pathways into greater professionalism when dealing with the public. 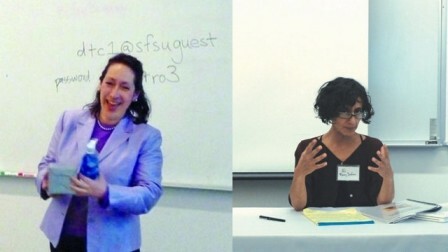 Fanny Suárez, a federal and state certified court interpreter in the Bay Area who also teaches Spanish/English Court Interpreting at SFSU, provided an overview of responsibilities embodied in the artful task of court interpreting—where mere bilingualism is not a sufficient condition. She emphasized the importance of training, being aware of rules of evidence, ethical standards, and a solid understanding of governmental regulations. According to Fanny, strong training in professional interpreting ensures that we avoid the temptation to add, omit, or alter information in any way. A dilemma that may arise when interpreting specialized language—such as complex medical or legal terminology—is to wonder whether the role of the interpreter is that of an advocate or a conveyer of meaning. Fanny emphasized that the role of court interpreters is to help non-English speakers access justice: a professional, neutral demeanor is essential. Essential to remaining neutral or impartial is the ability to render the same level of register, tone, regionalism, style, and apply the mastery of accurate interpretation to all parties involved in a conversation or case. This means avoiding the temptation to edit, summarize, or take any liberties that are not faithful to the language one hears. It is paramount to focus on converting the meaning, rather than mere words. » Interpreting for judges and attorneys while remaining faithful and neutral to the testimony. » Fatigue during prolonged sessions (team interpreting, most commonly used in ASL, is one solution). » Cognizance of their performance under pressure while interpreting for a witness. » The necessity to prepare beforehand to gain insight into potential linguistic variations. Request a pre-appearance interview, police records, or statements (particularly true of vast differences in regionalism, slang, and technical terms: Spanish is spoken in 20 countries and by 423 million speakers). » When two interpreters disagree with the rendition of a defendant’s meaning, the judge might call in a third to ask the defendant exactly what they meant. » Bilingual doctors and lawyers diminish the value of trained, professional, certified interpreting work by offering to interpret. » When the same interpreter is used for both plaintiff and defendant, the defendant can no longer be assured of impartiality under 6th amendment rights assuring sole representative counsel. themselves with established conventions while looking out both for themselves and for the truth. It has been demonstrated that accuracy in court interpreting diminishes by 30-40% after a 45-minute session. Therefore, interpreters must insist on the statutory right to take breaks. Aleira Salguero, a former student of Suárez who works as an in-house Spanish-English interpreter for Sutter Health Affiliates, provided an overview of present-day medical interpreting. Contrary to court interpreting, where teamwork is a possibility, medical interpreting is a solo show and preparation time is rarely available. While interpreting skills required for outpatient visits are straightforward, inpatient interpreting is a completely different world: it ranges from being the only interpreter for all specialists present at a family conference to having to deliver sad news. » Stay hydrated; breathe properly. » Ask for a break when you really need it and the timing is right. » If possible, obtain information about the case beforehand. » Be clear-minded to ensure accuracy. » If possible, choose and identify situations within your strengths. » If you observe that the patient has not grasped a heightened meaning, ask the provider if you might clarify a point. » Remember the importance of regular exercise after prolonged mental exercise. » The interpreter’s job is to convey the meaning of an utterance while staying faithful to all aspects of the register. » A glossary of commonly used terms is essential. » Established rules, if observed, diminish the stress level. » The temptation to get personally and emotionally involved must be resisted. » A skillful and sharp-minded interpreter can better serve a population for whom access to justice may depend on a professional performance. kim posted this article under Interpretation, NCTA Events, NCTA Meetings	on Sunday, January 1st, 2012 at 12:04 pm	You can follow any responses to this entry through the RSS 2.0 feed. Both comments and pings are currently closed.